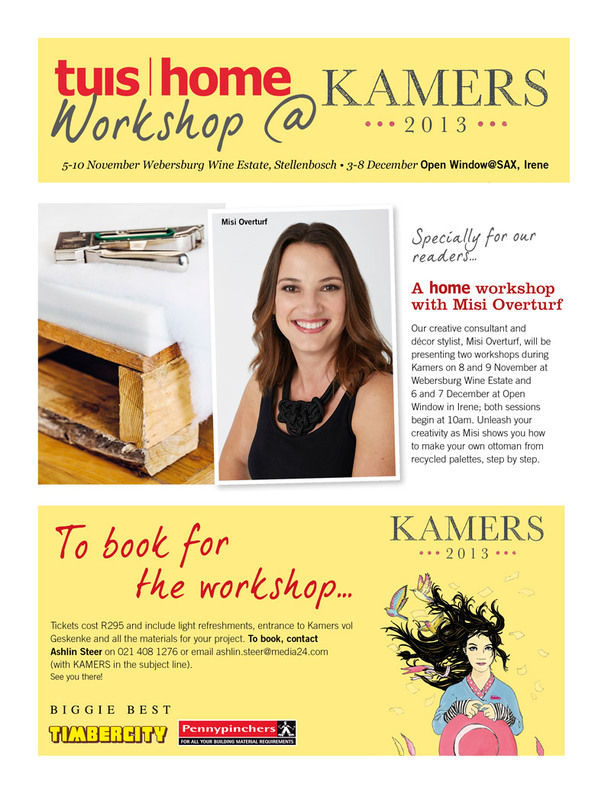 Misi Overturf, creative consultant and decor stylist for HOME and TUIS magazines, will be presenting creative workshops at KAMERS Stellenbosch on 8 and 9 November and KAMERS Irene on 6 and 7 December. Join her for a fresh, innovative experience as you learn how to make your own ottoman from recycled palettes. More details and booking info below. Tags: decor, HOME, Irene, KAMERS 2013, Misi Overturf, ottoman, palettes, Pretoria, recycle, Stellenbosch, TUIS, workshop. Bookmark the permalink. How do I make a booking for my husband to join the workshop on the ottoman? Colette, please contact Ashlin Steer at 021 408 1276, or ashlin.steer@media24.com.